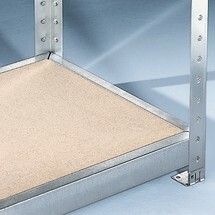 This chipboard for the META wide-span rack is an extension to the base unit. The shelves are adjusted in height in increments of 50 mm. The surface of the load-bearing material is natural. The steel panels for the META wide-span rack are made of robust steel sheet plate and galvanised. Consequently they are resistant to corrosion in the long term. Their height can be adjusted by 50 mm to adapt them to the load. 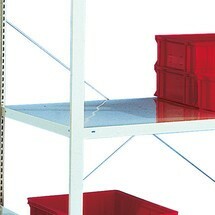 This shelf for the META wide-span rack will enable you to expand your options. It is made of steel plate, single-row and painted light grey. 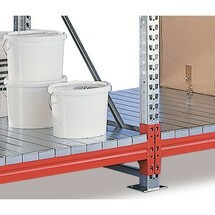 It can be attached to the large rack unit via a boltless system. 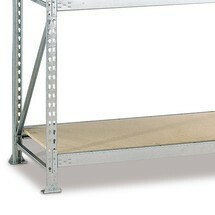 The additional level for the META wide-span rack made of steel panels gives you a solid base for your loads. The steel panels are particularly suitable for bulky, voluminous or heavy parts. The shelf for META wide-span racks is made from chipboard with galvanised steel plate edges. This makes it highly robust and corrosion-resistant. Note the maximum unit load for additional shelves. 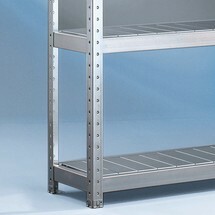 This shelf for the META wide-span rack with galvanised steel panels enables the rack to be easily adapted to the loads. When adding additional shelves, take note of the maximum shelf load of the wide-span rack.